An Assistant Swim Coach assists the coach in training and making perfect the swimmers in the sport of swimming. Some of the common tasks that are taken up by these assistants to swim coach are supporting the head coach in training and performing the various managerial activities, helping and supporting the amateurs in learning and understanding the techniques of swimming, assisting the professional swimmers in excel in competitions and teaching them the tricks and strategies to out beat their competitors. 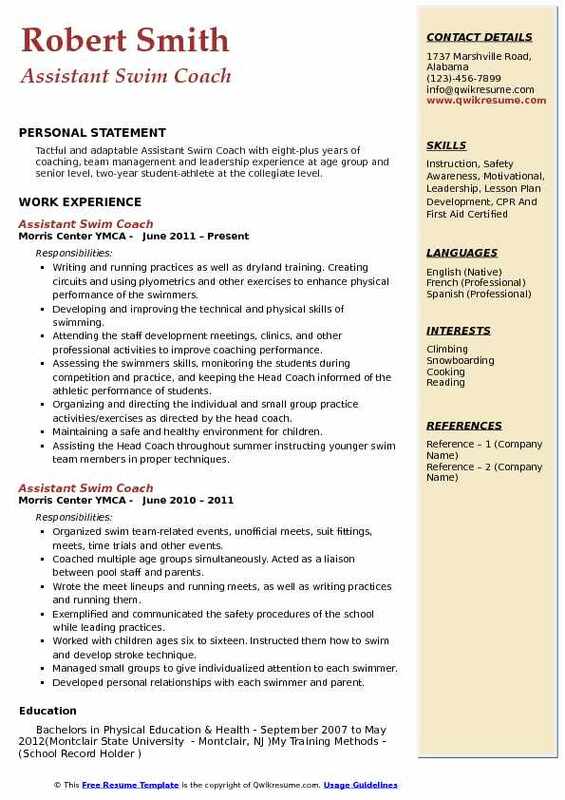 Some of the best Assistant Swim Coach Resume depicts skills such as teaching ability, ability to respond to emergencies and outstanding coaching knowledge. 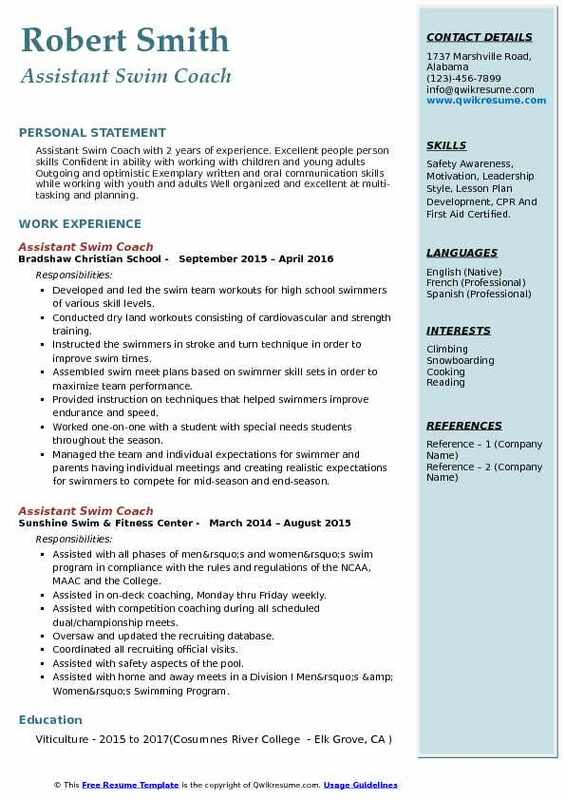 To be considered for the job of an Assistant Swim Coach, applicants must display a certification in Swimming and lifesaving classes in their resumes. 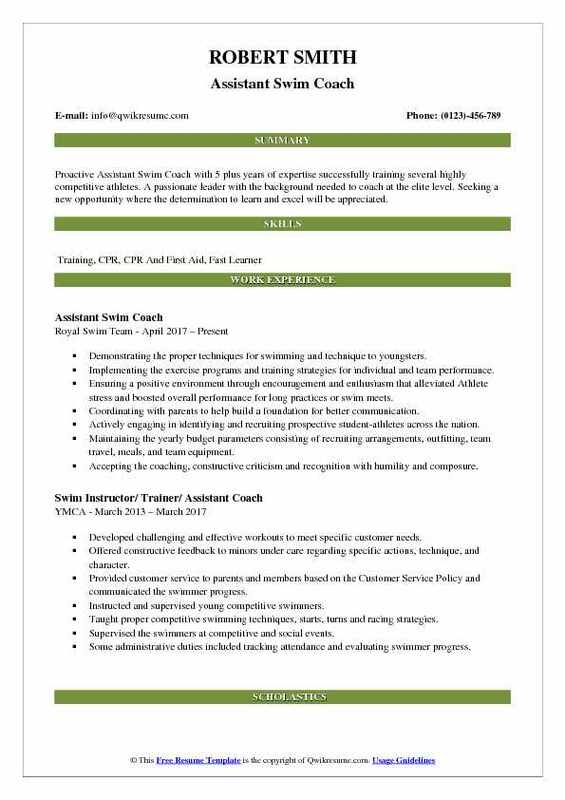 Objective : Assistant Swim Coach with 4 years of experience is seeking an opportunity to implement my skills and education in the areas of Financial Management and Accounting. Responsible for scheduling swimmers events for weekly meets utilizing complex software systems. Possessed strong analytical, assessment, mathematical and time management skills. Possessed the ability to utilize a Bloomberg machine for the purpose of analyzing investment data; e.g. Yield curves, price ratios, bond ratings, etc. One of five coaches that coached over 140 children between the ages of 5 to 18 every day for the summer season. Assisted athletes with training in both dry land and wetland training. Encouraged every swimmer to swim to beat their personal best and enacted swimming techniques to help achieve their goals. Leveraged a variety of coaching techniques including digital applications and one-on-one interaction. Headline : A dedicated Assistant Swim Coach with 6 years of experience who is always looking to expand my skill set. I am technologically savvy and a quick learner. Experience in handling an increasing set of responsibilities has allowed me to become accustomed to performing well under pressure. I have strategic relationship- and partnership-building skills, and am able to solve problems creatively and use tact and diplomacy to achieve win-win outcomes. Interacted with parents and school officials to ensure proper communication channels were established and maintained. Worked alongside athletes to develop training plans to meet short-term and seasonal goals. Worked together with school officials to ensure athletes needs were met and a positive and goal-oriented environment was provided. Communicated with state officials to ensure proper regulations were followed. Fielded questions and concerns from parents and helped work together to create a scenario to ensure satisfactory changes or results could be realized within operating parameters. Encouraged youth to participate in athletic swimming (competitive or non-competitive programs). Worked closely with the head coach in scheduling interscholastic contests. Maintained thorough knowledge of all rules, game procedures, coaching techniques, and current trends. Headline : Proactive Assistant Swim Coach with 5 plus years of expertise successfully training several highly competitive athletes. A passionate leader with the background needed to coach at the elite level. Seeking a new opportunity where the determination to learn and excel will be appreciated. Demonstrating the proper techniques for swimming and technique to youngsters. Implementing the exercise programs and training strategies for individual and team performance. Ensuring a positive environment through encouragement and enthusiasm that alleviated Athlete stress and boosted overall performance for long practices or swim meets. Coordinating with parents to help build a foundation for better communication. Actively engaging in identifying and recruiting prospective student-athletes across the nation. Maintaining the yearly budget parameters consisting of recruiting arrangements, outfitting, team travel, meals, and team equipment. Accepting the coaching, constructive criticism and recognition with humility and composure. 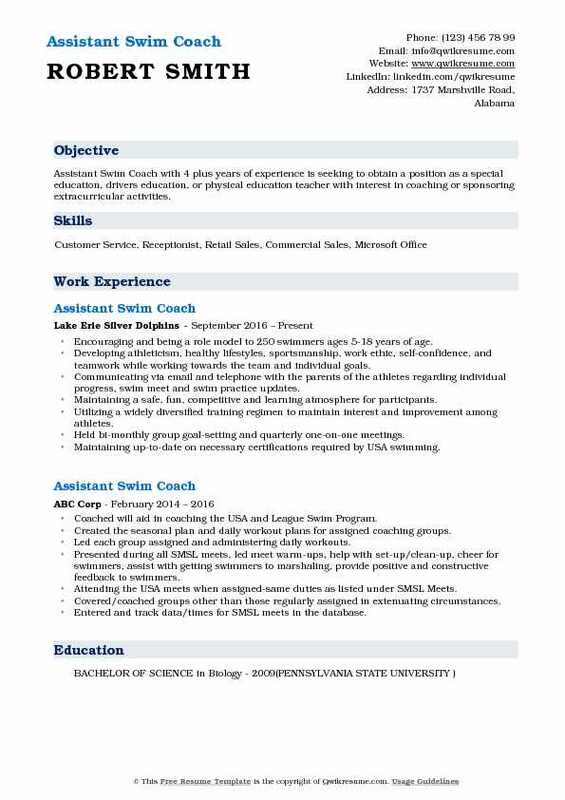 Summary : Goal-oriented, imaginative, and introspective Assistant Swim Coach with 8 years of experience working with individuals of all ages. Characterized by persistence in developing ideas or solving problems. Proficient in Microsoft Office programs, social media platforms, and ATS. Developing and executing the appropriate practice plans for all levels of athletes, swimmers, and lacrosse players. Informing and tracking the athletes and parents of required paperwork for eligibility. Ordering, managing, distributing and collecting the equipment and uniforms. Communicated transportation, events and fundraising with athletes and parents. Recording, compiling and analyzing the meet/game statistics regularly for strategy and measurement of team and athlete development. Effectively implementing stroke and start checklists for legality and safety among age group swimmers. Effectively designed a dry-land and weight room work out regimen, creating group based competitions in both to optimize swimmer involvement. Experience providing strategic leadership, drive and superior operational results within a division 1 program. Objective : Assistant Swim Coach with 2 years of experience. Excellent people person skills Confident in ability with working with children and young adults Outgoing and optimistic Exemplary written and oral communication skills while working with youth and adults Well organized and excellent at multi-tasking and planning. Skills : Safety Awareness, Motivation, Leadership Style, Lesson Plan Development, CPR And First Aid Certified. Developed and led the swim team workouts for high school swimmers of various skill levels. Conducted dry land workouts consisting of cardiovascular and strength training. Instructed the swimmers in stroke and turn technique in order to improve swim times. Assembled swim meet plans based on swimmer skill sets in order to maximize team performance. Provided instruction on techniques that helped swimmers improve endurance and speed. Worked one-on-one with a student with special needs students throughout the season. Managed the team and individual expectations for swimmer and parents having individual meetings and creating realistic expectations for swimmers to compete for mid-season and end-season. Mentored and developed student-athletes on time management, leadership, and life skills. 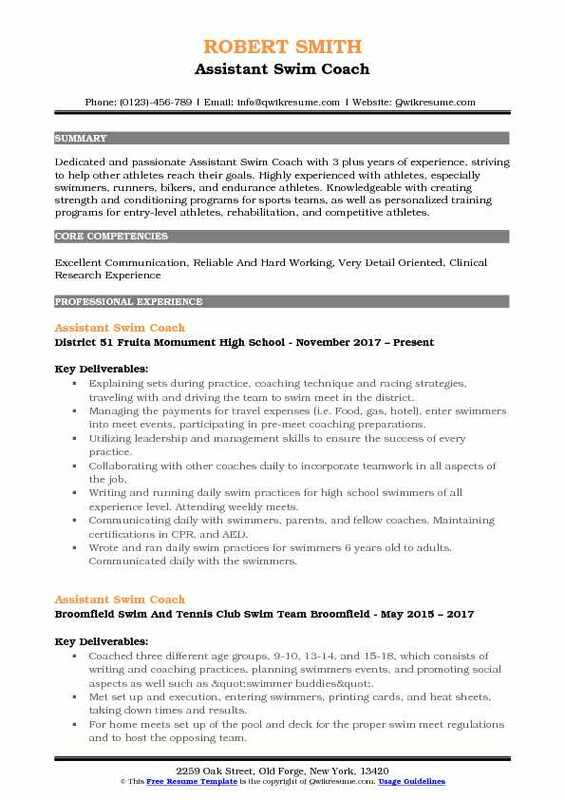 Objective : Assistant Swim Coach with 4 plus years of experience is seeking to obtain a position as a special education, drivers education, or physical education teacher with interest in coaching or sponsoring extracurricular activities. Encouraging and being a role model to 250 swimmers ages 5-18 years of age. Developing athleticism, healthy lifestyles, sportsmanship, work ethic, self-confidence, and teamwork while working towards the team and individual goals. Communicating via email and telephone with the parents of the athletes regarding individual progress, swim meet and swim practice updates. Maintaining a safe, fun, competitive and learning atmosphere for participants. Utilizing a widely diversified training regimen to maintain interest and improvement among athletes. Held bi-monthly group goal-setting and quarterly one-on-one meetings. Maintaining up-to-date on necessary certifications required by USA swimming. Attended ACSA world conference events at own expense to gain specialized coaching certifications and become more involved in the international swimming community. 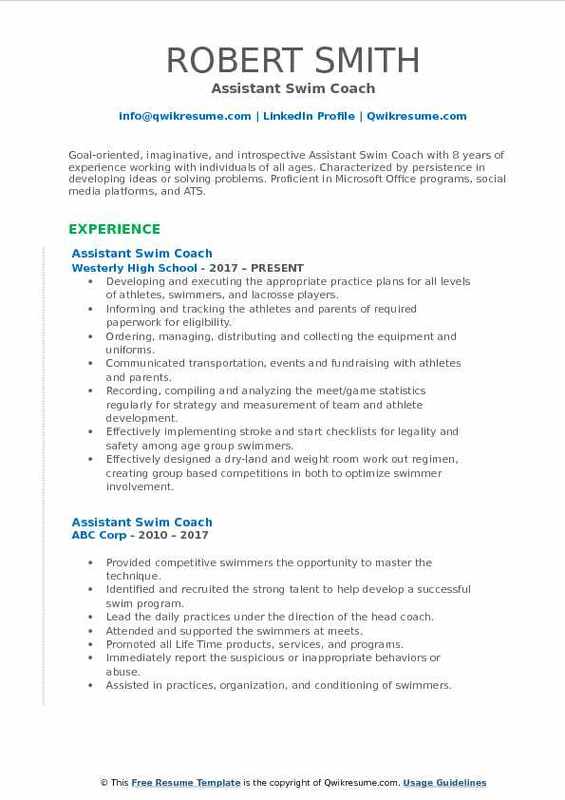 Objective : Assistant Swim Coach with 2 years of experience is seeking an environment to enhance the experience as an Athletic and Academic Coach/Counselor and Mentor; while deepening customer service and interpersonal relationship skills Core Strengths Communication Teamwork Leadership. Skills : Microsoft Office, Multi-tasking, Business Process, Mapping, Business Artifacts, Documentation, Data Entry. Wrote and implemented workouts and adjusted them according to various athlete needs. 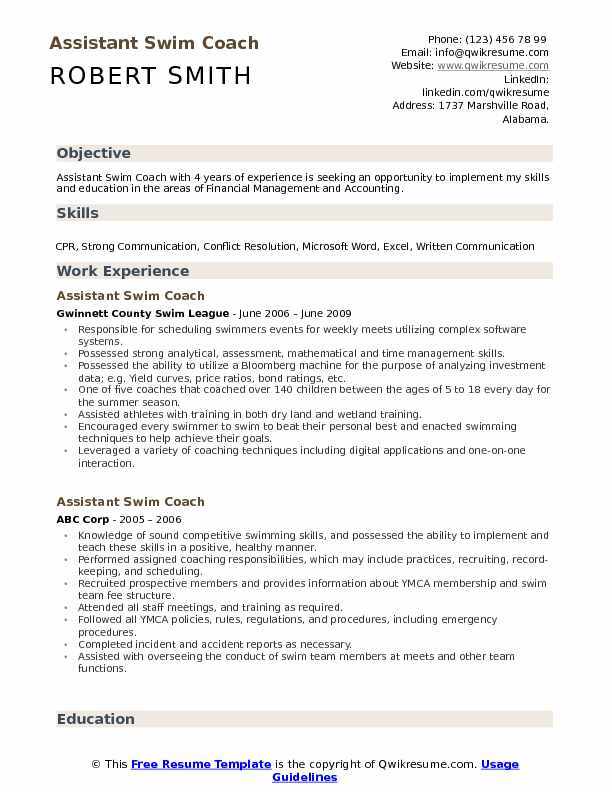 Maintained thorough knowledge of all rules, met procedures, coaching techniques, and current trends in competitive swimming. Worked closely with the Head Coach in seasonal planning, meeting attendance, and athletic progress. Formulated and administered individualized workouts to 100 swimmers between ages 4 and 18. Responsible for creating the optimal meet line-up in accordance to our opponents' strengths and weaknesses. Refined professional communication skills through constant contact with the swimmer's parents and the advisory. Taught volunteer swim lessons to children focusing on technique and racing skills. Coaching all age groups, primarily 11/12 - senior age groups (had a senior boy qualify for YMCA Nationals in the 100 backstroke). 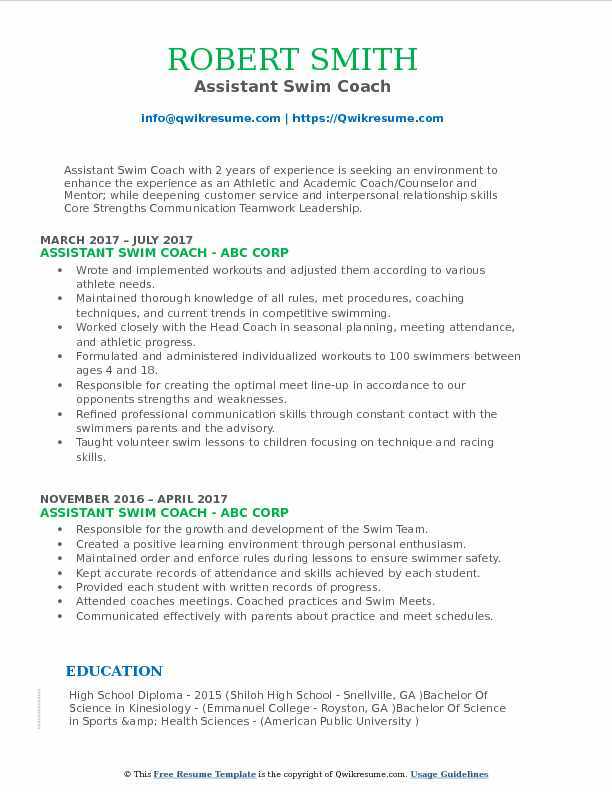 Objective : Dedicated and passionate Assistant Swim Coach with 3 plus years of experience, striving to help other athletes reach their goals. Highly experienced with athletes, especially swimmers, runners, bikers, and endurance athletes. Knowledgeable with creating strength and conditioning programs for sports teams, as well as personalized training programs for entry-level athletes, rehabilitation, and competitive athletes. Explaining sets during practice, coaching technique and racing strategies, traveling with and driving the team to swim meet in the district. Managing the payments for travel expenses (i.e. Food, gas, hotel), enter swimmers into meet events, participating in pre-meet coaching preparations. Utilizing leadership and management skills to ensure the success of every practice. Collaborating with other coaches daily to incorporate teamwork in all aspects of the job. Writing and running daily swim practices for high school swimmers of all experience level. Attending weekly meets. Communicating daily with swimmers, parents, and fellow coaches. Maintaining certifications in CPR, and AED. Wrote and ran daily swim practices for swimmers 6 years old to adults. Communicated daily with the swimmers. Responsible for the teaching and development of the swimming ability of the younger children on the team. 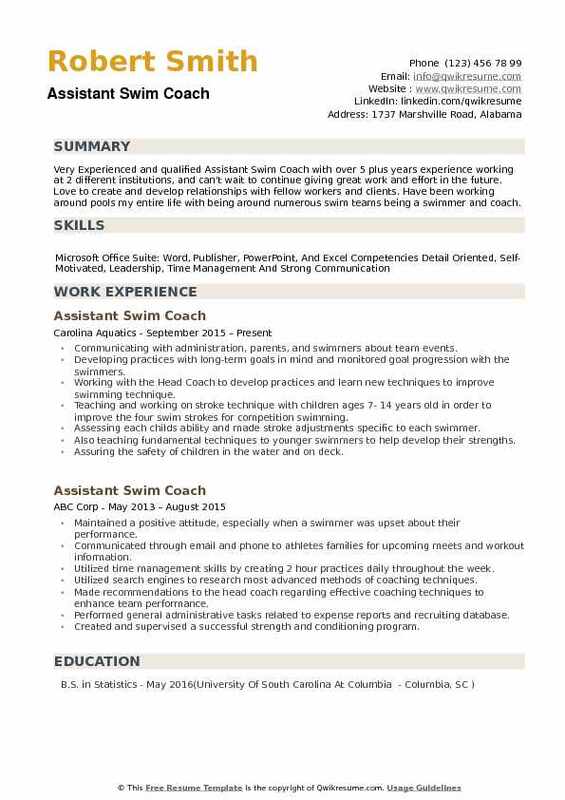 Summary : Tactful and adaptable Assistant Swim Coach with eight-plus years of coaching, team management and leadership experience at age group and senior level, two-year student-athlete at the collegiate level. Writing and running practices as well as dryland training. Creating circuits and using plyometrics and other exercises to enhance physical performance of the swimmers. Developing and improving the technical and physical skills of swimming. Attending the staff development meetings, clinics, and other professional activities to improve coaching performance. Assessing the swimmer's skills, monitoring the students during competition and practice, and keeping the Head Coach informed of the athletic performance of students. Organizing and directing the individual and small group practice activities/exercises as directed by the head coach. Maintaining a safe and healthy environment for children. Assisting the Head Coach throughout summer instructing younger swim team members in proper techniques. 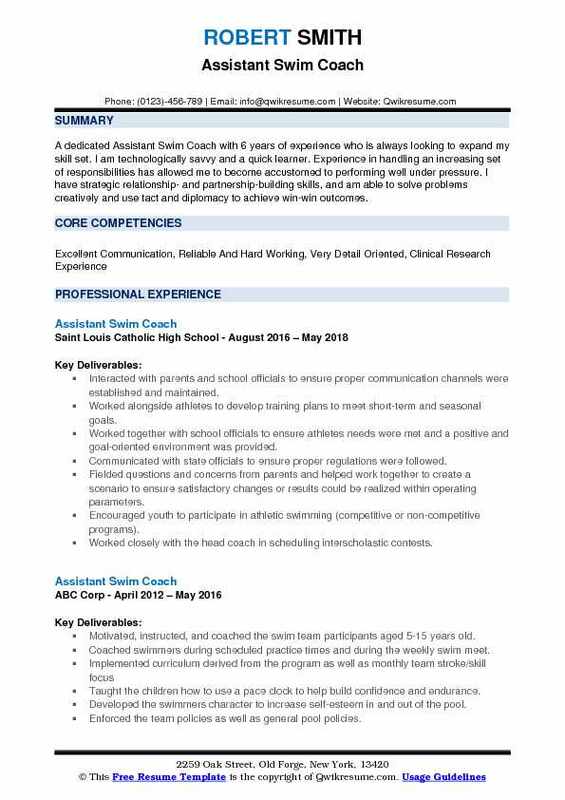 Headline : Very Experienced and qualified Assistant Swim Coach with over 5 plus years experience working at 2 different institutions, and can't wait to continue giving great work and effort in the future. Love to create and develop relationships with fellow workers and clients. Have been working around pools my entire life with being around numerous swim teams being a swimmer and coach. Communicating with administration, parents, and swimmers about team events. Developing practices with long-term goals in mind and monitored goal progression with the swimmers. Working with the Head Coach to develop practices and learn new techniques to improve swimming technique. Teaching and working on stroke technique with children ages 7- 14 years old in order to improve the four swim strokes for competition swimming. Assessing each child's ability and made stroke adjustments specific to each swimmer. Also teaching fundamental techniques to younger swimmers to help develop their strengths. Assuring the safety of children in the water and on deck. Communicating with the Head Coach and other coaches about the team's progress and future plans. Traveling to swim meets with the team where I recorded times and discussed each swimmers race with them individually.